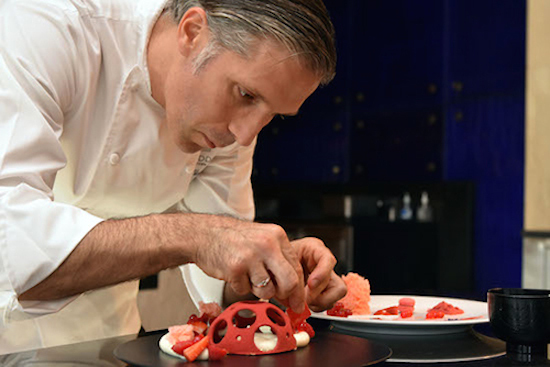 In the second of this trio of blogs for The Huffington Post, I got to catch up with another magical chef, and admire (but also taste of course) his creation. 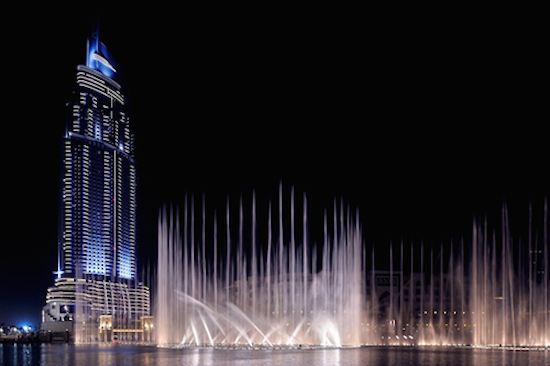 The Dubai Fountain and neighboring hotel, The Address DowntownDon’t know about you but hearing the words “red velvet” always makes me think of those wondrous events where mere mortals are kept away from the celebrities by velvet ropes. In the United Arab Emirates, there is no lack of premieres or celebrities, as highlighted by recent sightings that ranged from Jackie Chan to Brad Pitt (plus Angelina), Dennis Quaid, Malala and the entire Star Trek Beyond cast. Things are only bound to get steamier once the Dubai International Film Festival kicks off in early December. I started out knowing full well that I would be awed by the wonderful ambiance of Downtown Dubai, now a must-visit tourist destination but also a gourmet and fashion mecca for any self-respecting jet-setting world traveler, and that the chefs’ creations would remind me why I love food — and those who prepare it with passion — so much. But what I didn’t expect was to find such distinct interpretations by three men who each represent the best the world has to offer. As chefs of course but also, most importantly, as human beings. This entry was posted on Saturday, December 5th, 2015 at 5:03 am and is filed under Chocolate Corner, Food, Interviews, Man's Opinion, Style Icons, Woman About Town.